Garrett's Ministry Blog: February Update!! The month of January has been a blast. I can't completely describe to you all the ways I am excited about and thankful for what God has been doing in the Focus ministries, but I'm going to try! First on the docket is Winter Camp 2015. Goooodddnneesssssss. 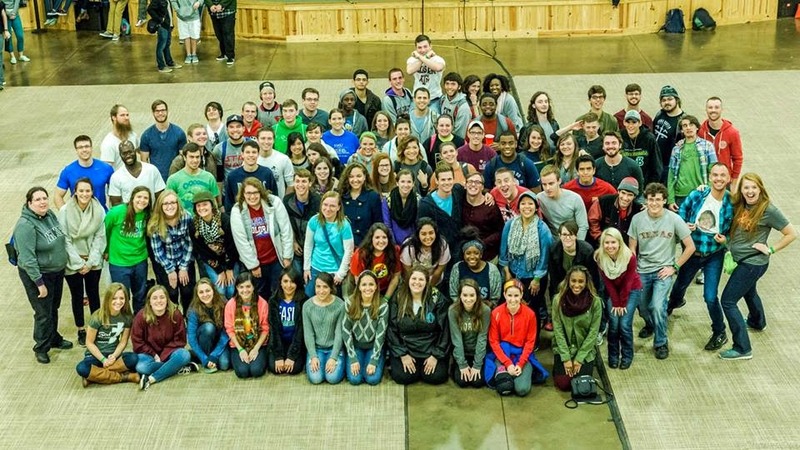 We had around 500 students from all of our campuses show up to Sky Ranch on MLK weekend for 4 days, and it was amazing. The way God is faithful to show up and work in people never ceases to awe me. Worship was an amazing time, with leaders from multiple campuses leading us. Our speaker, Iain Provan who is a professor of Old Testament theology at Regent College in Vancouver, did an amazing job teaching us and stretching our minds. And, as always, our students continue to be Jesus to one another and it makes for a truly life-bringing experience. A picture of our Collin College students is above! Winter Camp also marks the beginning of our Spring semester at Collin. We've started back up meeting as an entire ministry, and our core groups have begun as well. I love our community! Many new one on one studies are beginning at this time as well. Spring is the time when we begin to start raising up leaders for the next year. At Collin, unlike the four-year universities, we have a very high turnover rate. We lose approximately 70-95% of our ministry every year to students transferring out, people moving on, etc. Because of that, it's imperative that we are very purposeful about making new leaders and giving students in our ministry the opportunity to step up and lead their peers in Christ. Discipleship Class is going to start back up this week as well. We've actually managed to reserve one of two large lecture halls in order to accommodate all the students we've been having. We're also opening it up to the entire campus so that any student can stop in on Fridays between 12-2 to study the gospel of Mark academically. Another exciting initiative we are beginning is something called "Turkish Coffee Time". We are partnering with another ministry on campus with the express goal of opening up communication between Christian students and Muslim students on campus. This will be Fridays right before D Class and will give the students that come another opportunity to come to D Class. Our students are very excited about this! Finally, I want to ask that you be praying about one main thing (although we need prayer in every area): choosing and raising up leaders for next year. I think people do not quite understand how much our student leaders lead our ministries. We are a staff that aims to enable these students, not turn them into dogmatic drones. How we choose leaders, and who we choose plays the most essential role in the success of Focus. So please pray for God to send workers into the harvest, and ask that he teaches us to discern who they are! Thank you so much for all of your help and support. You truly are our partners in being missionaries on these campuses. Blessings!